This bag is sure to make others look twice. The RIONI Amour was produced using two natural tones of rich Italian leather. The unique braided dual handles give this collection its true name, Amour. Gold rings. 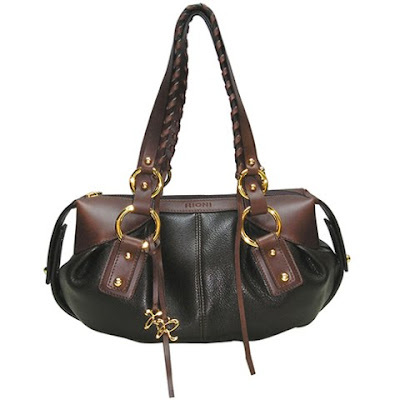 Accented with RIONI charms and leather strands makes this bag a keeper. Black fabric RIONI monogram print lining. Zipper opening entrance. Interior contains a pouch pocket, cell phone holder, and a zipper pocket. Dimensions: L12 x W4 x H7.5"
I like that this is a smaller handbag, very classic looking. VERY well-made, and high quality. I really like this brand of handbags! Aww Whit, you keep postin up these gorg handbags that I can't afford! LOL! My budget is PAYLESS! LOL!